“Abe and Fido” « Hercules and the umpire. Two of may favorites subjects are President Lincoln and dogs. 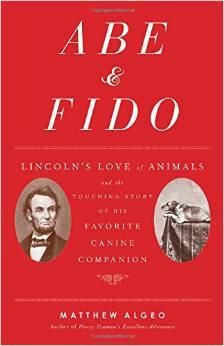 In that regard, please read Terri Schlichenmeyer, Lincoln’s love for animals detailed in ‘Abe & Fido’, Evansville Courier&Press (June 13, 2015) (book review of Matthew Algeo‘s new book “Abe & Fido”). In early 1861, as he prepared to leave his home in Springfield, Illinois, to move into the White House, Abraham Lincoln faced many momentous tasks, but none he dreaded more than telling his two youngest sons, Willie and Tad, that the family’s beloved pet dog, Fido, would not be accompanying them to Washington. Lincoln, who had adopted Fido about five years earlier, was afraid the skittish dog wouldn’t survive the long rail journey, so he decided to leave the mutt behind with friends in Springfield. Abe & Fido tells the story of two friends, an unlikely tandem who each became famous and died prematurely. My Kindle will soon be buzzing to alert me that I am the proud new owner of Abe & Fido. PS Thanks to Elaine Mittleman for the wonderful suggestion. I just finished reading “Lincoln’s Ladder to the Presidency: The Eighth Judicial Circuit” by Guy Fraker. Mr. Fraker is a Central Illinois lawyer (my home turf) and did quite a bit of research on Lincoln’s law practice in the Eighth Judicial Circuit in Illinois, including how the circuit changed drastically once the railroads came through. There’s a bit of dry “in this county Lincoln had the most cases with X lawyer and the most cases against Y lawyer”, but as someone who knows the area, it was fascinating to read about how some of the towns ended up where they are, and how during the Douglas/Lincoln Senate race Douglas had a dedicated rail car with the Illinois Central while Lincoln rode the normal passenger trains (Lincoln was disliked by the chief engineer of the Illinois Central at the time, one George McClellan.) There is, of course, a Kindle edition.